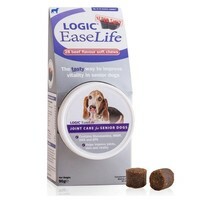 Logic EaseLife for Dogs has been developed to help improve mind vitality, skin condition and mobility in senior dogs. Each delicious soft chew combines a wide variety of essential nutrients to help support vitality in older dogs and contains glucosamine and MSM to help soothe stiff, aching joints and promote mobility. Each pack contains 28 chews.